A finalist in the live category, SketchFactor is an app that will let you know the ‘”relative sketchiness” (weird/cool factor, too!) of a neighborhood. You will no longer feel the threat of being mugged or stabbed with this navigation app, powered by crime data. A SketchFactor: 1 might be kind of quirky. A SketchFactor: 5 could be dangerous. User experiences are also taken and added to city data, to give you the real information on what’s really happening on the city street. Co-founders Daniel Herrington and Allison McGuire join us today. SketchFactor is a crowdsourced navigation app that shows the relative sketchiness of an area. We give users the experience of a city—how NY feels, LA tastes, and SF smells. 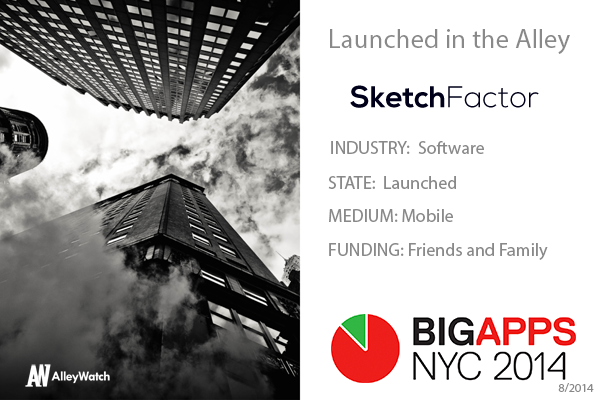 SketchFactor is focused on improving walking navigations in U.S. cities and, ultimately, the world. Navigation apps currently tell you where streets intersect and where certain businesses exist, but they give you no insight into the experience of those blocks. SketchFactor change this. Don’t just take the shortest walk – take the least sketchy path, according to your preferences. Think of us as a modern day yellow brick road. Initially we’re targeting the 169.7M U.S. smartphone owners. Our target market is individuals who use their phones for navigation: 82M. Our marketing is aimed at appealing to Millennials, ages 18-35. What are the “Sketchiest”neighborhoods in New York according to the app? Good question! We’ve been in beta testing, so most of the incidents reported have been downtown. However, it’s important to note that SketchFactor doesn’t label certain areas or neighborhoods as sketchy. We’re super granular; we can tell you which block to avoid, based on your preferences. For example, if you experience racial profiling, and a certain block is known for having those experiences, you can see where those incidents have been reported. Sketchiness is defined by our users and we crowdsource those opinions. We’re currently focused on gaining a large user base and determining the best monetization model when we have more information on user engagement levels. We are currently preparing for integrated advertising (example: given your two route options, one route has a 2 for 1 margarita deal via your local Mexican restaurant) and a larger data play (segmenting data for interested parties and packaging it to their needs). We were encouraged to apply to NYC BigApps by Paul Tumpowsky, a former judge of the competition. He was impressed with our unique application and thoughtful approach—plus, he saw SketchFactor as a boon to NY navigation—then convinced us to apply. When we checked out past winners, current competition details, and parameters, we knew we’d be a great fit. We had a blast at the NYC BigApps competition and made a weekend out of the event: our lead iOS developer came in from Philly to watch cofounders Allison McGuire and Daniel Herrington pitch; we made new friends; and we explored some incredibly exciting technology being developed in NY. We’re in the Live category. We chose one category to be deliberate about our application and specific about the people we’re targeting. New York living is about walking. We’re looking to fundamentally change the way people navigate on foot. By providing users with more information, curated in a digestible, fun way, we’ll improve users’experience of the city. 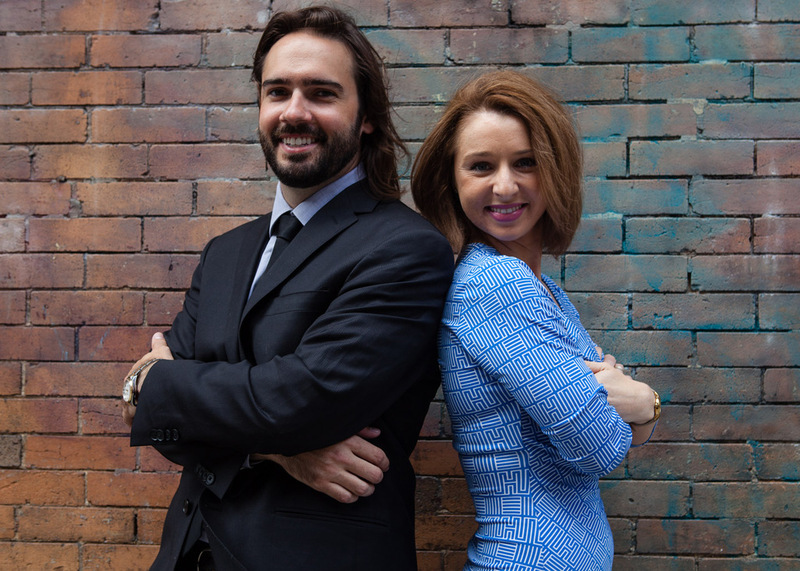 Our cofounders, Allison McGuire and Daniel Herrington, are passionate (meet us in real life! ), dedicated (we quit our jobs to bring SketchFactor to life), and brand new New Yorkers (we knew this would be the best place for the company’s launch). Plus, they have complementary expertise (Allison in strategic communications and community outreach, Daniel in engineering and sales). That’s our winning formula. The resources here are innumerable and our app fits the city. New York is a walking city, SketchFactor is a walking app. New York is creative, SketchFactor is a fresh approach to an ongoing problem (city navigation). New York is weird and gritty, SketchFactor is a home for both the bizarre and dangerous. New York has myriad datasets, SketchFactor is a data-driven app. It was a no-brainer to move here and launch. We’d be thrilled to win NYC BigApps because we’d get access to more of the resources we need to grow. We’re always looking to improve—this exposure would help us make our product better, recruit top talent, and hear valuable feedback. In addition, as a new-to-NY startup, this would be the boost we need to be fully integrated into the Silicon Alley community. Chris Fralic, Partner at First Round. We’re impressed by his creativity, enthusiasm, and business savvy. We’d benefit from hearing his feedback on our concept, design, and approach. Plus, his portfolio is striking, his expertise is deep, and he has a sense of humor. All attributes we appreciate. Where’s the best place to eat at 1am in New York? Shamelessly ordering Seamless to the office.